Although Hara made 73 films in her 30-year career, she is best known for her work with three major post-war auteurs: Akira Kurosawa, Mikio Naruse and Yasujiro Ozu. Starring in their films–a dozen in all–she brought to life a kind of modern young woman whose good manners don’t entirely mask a strong and somewhat unconventional will. However charming and polite the characters are, Hara never portrays them as pushovers. Moreover, they tend to choose more difficult paths than are expected of them, adding tension and an element of surprise to otherwise straightforward plots. At the start of Kurosawa’s “No Regrets for Our Youth,” (1946) Hara’s character, Yukie, the privileged daughter of a leftist university professor, has two suitors, both students of her father’s. Their innocent love triangle turns darker after Yukie marries the more radical of the two, who by the beginning of WWII is imprisoned as a spy. After he is executed for treason, she performs the filial–and, given the wartime circumstances, unthinkable–act of exiling herself to the countryside. There she devotes herself to her husband’s elderly parents and helps their fellow farmers, who previously persecuted the family for producing a traitor. “No Regrets for Our Youth,” one of the first Japanese features made after WWII, was influenced not only by a true story but Italian Neo-Realism, particularly Rossellini’s “Paisan” and “Rome: Open City.” 64 years after its release, it shows its age stylistically but remains emotionally devastating. In large part, this is because of Setsuko Hara’s powerful performance. As Yukie changes before our eyes from a flippant schoolgirl to political prisoner’s wife to crusading widow, she becomes not only the film’s central character but its moral force. During the Occupation, Hara began acting in the quiet, domestic films of Yasujiro Ozu, beginning in 1949 with “Late Spring.” About a widowed father’s ruse to get his daughter, Noriko, to overcome her reluctance to leave him in order to marry, “Late Spring” introduced audiences to Hara’s emblematic young woman and gave rise to the “Eternal Virgin” title. Next came “Early Summer,” (1951), in which she plays a 28-year-old single woman–also named Noriko–living with her extended family, who pressure her to choose a husband. As in “Late Spring,” Noriko is a woman determined to do the right thing not only for her family but for herself. In “Early Summer,” Noriko’s marriage literally will split up the family, as her lost income leaves the family unable to afford the rent on their Kamakura house. Nevertheless, her parents, brother and sister-in-law all campaign to arrange a marriage, knowing that remaining single would consign her to stasis. The fact that Noriko stunningly rejects her family’s choice in order to marry a widower with a child (the best friend of her brother, another MIA), and move to Akita (a far-north boondocks) doesn’t change the outcome for her family. In 1953 came Ozu’s “Tokyo Story,” which many consider one of the greatest films of all time. In it, an elderly couple travel from the countryside to visit their adult son and daughter in Tokyo, who have no time for them in the midst of their busy, citified lives. After much selfish behavior on both the children’s parts, the adult daughter bullies their sister-in-law, again named Noriko, to take the old couple off their hands for a day. Setsuko Hara’s Noriko is a model of filial piety and rectitude, an impoverished widow who takes a day off work to take her parents-in-law sightseeing and scrounges a celebratory meal with sake borrowed from a neighbor. Aside from the elderly couple, Noriko is the only good person in the entire film. In Setsuko Hara, Ozu found his muse. Their association lasted long enough to produce “Late Autumn,” a fascinating inversion of “Late Spring,” in which Hara plays a widowed mother who persuades her reluctant daughter to leave her and marry. 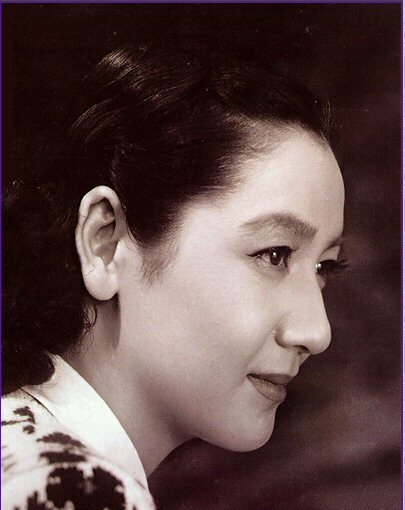 That she was able to make six films with Ozu was no mean feat in light of his directorial style. It was not unusual for the director to shoot 40 takes of his long, dialogue-heavy scenes, a habit that put enormous pressure on his stars. (As Donald Ritchie has noted, the reason Ozu worked repeatedly with the same group of actors–notably Chishu Ryu, Chieko Higashiyama and Haruko Sugimura–is that a lot of others simply couldn’t take the strain. The fact that Ozu invariably shot his films during Tokyo’s hot, humid summers (in order to make a festival deadline) made the process even more daunting. Yet in film after film, Setsuko Hara embues her characters with grace. Like all great actors, she knows how to be still; her physical control, in combination with a beautiful, throaty voice and strikingly large eyes, makes her performances perfect. In the same period as her work for Ozu, Hara made two notable films for Naruse Mikio: “Repast” (1951) and “The Sound of the Mountain” (1954), the latter based on Nobel Laureate Yasunari Kawabata’s famous novel. In both she plays wives making the best of unhappy marriages to disappointing, caddish men. As Michiyo, the neglected wife in “Repast,” Hara’s constructs a cheerful, stoic exterior that is jarred by visit from her vivacious Tokyo niece. In “The Sound of the Mountain,” Kikuko’s marriage to her philandering husband is juxtaposed with loving, close relationship she has with his parents, particularly his father. Setusko Hara is often thought to have stopped acting because of Ozu’s death in 1963, a fitting end to a distinguished career. In fact, she made her last two films in 1966 and gave a quite different reason for retirement. Claiming she did not enjoy acting and only did so to support her natal family, Hara dismayed countless fans who looked up to her both as an actress and role model. Nevertheless, at 46 she turned her back on her film career for good: now 90, she has refused requests for interviews and photographs for nearly half her lifetime. Like Ozu, she never married, a truly radical decision for a Japanese of her generation. Until recently, marriage in Japan was far more than a rite of passage: it was an obligation that men and women undertook regardless of personal or sexual preference. By declining to marry, Hara (and Ozu before her) firmly set herself apart from societal norms–and indeed from life as most of her peers knew it. She continues to live quietly in Kamakura, the seaside town (and Tokyo suburb) where “Early Summer” was so memorably set. Though some have compared her to Garbo, Hara’s retreat from society harkens back to the Heian Period, when Japanese emperors often abdicated to enter monasteries and live out their days in peace and contemplation. Yet their reclusion, like Setsuko Hara’s, did not go unheralded by the outside world; in fact, it often served to increase their stature in it. are there recent photos of her? In the past year, I’ve hard the good fortune to view “Tokyo Story”, “Late Autumn” and — just yesterday — “Late Spring” on a big screen. Wonderful films, and it’s interesting when viewing them to realize that Setsuko Hara — and, for that matter, Yasujiro Ozu — didn’t get married. Have you seen Keisuke Kinoshita’s “Here’s to the Young Lady”? I think it may be my favorite Setsuko Hara film. Thanks for writing about her, and in such a fine way too. Thanks for writing; I’m glad you liked the piece. I haven’t heard of “Here’s to the Young Lady” but will be sure to look for it. “Here’s to the Young Lady” must be fairly unknown. Thank you for recommending it! I think her films made a lasting impression on many of us. Happily we always have her on film! You’re welcome–I hope more people will discover her films. Setsuko Hara’s death was just announced today; she was 95. For more, please see the home page.